But there are growing doubts that Tesla will meet its production target. And that would raise new concerns about its finances – including the potential need to go back for more capital this year as the company’s cash reserves dwindle. But Tesla has also run into some new snags. News reports earlier this week suggested that battery supplier Panasonic – which jointly participates in Tesla’s Gigafactory in Nevada, as well as running its own plant in New York – was facing some supply shortages that could snag Model 3 output. Meanwhile, Tesla has also faced a variety of its own issues, including at least two Fremont fires this month. Both appeared to be relatively minor, but they still forced temporary production halts. The company has not said whether the hacked software has had any impact on production. But a new report by Reuters cautions that Tesla does not appear to be on track to make its 5,000 vehicle-a-week target by tomorrow, the end of the second quarter. The news service quotes three unnamed line workers who, among other things, reported on what Tesla was displaying on Fremont plant monitors where it shows employees how many vehicles are rolling out on each 12-hour shift. 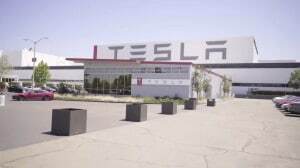 In its frantic bid to get to the 5,000 target, Tesla has gone to a 24/7 production schedule. That is not unusual in the industry for products in high demand. But automotive experts also warn that operating flat out, with no breaks in production, runs the risk of limiting preventative maintenance which, in turn, could lead to serious issues in the event of a machine malfunction along the line. In its new report, Reuters quoted one employee as pointing to the paint shop as a key production bottleneck. That’s often the source of trouble for other auto factories too. “Basically we have been in a long endurance race, and now the coach is yelling at us for a four-mile finishing kick,” another employee working at the company’s Gigafactory battery plant told Reuters. Musk has often criticized news coverage of the company, claiming it is inaccurate in its portrayal of Model 3 production problems. In its lawsuit, Tesla specifically named former employee Tripp of providing news outlets with false information about factory problems. But other sources have continued to warn that Tesla’s balls-to-the-wall production push is risky, among other things, resulting in quality problems that require rework once vehicles roll off the line, delaying shipments and sales. This entry was posted on Friday, June 29th, 2018 at and is filed under Automakers, Automobiles, Business, EVs, Earnings, Electrified Vehicles, Executives, Financials, Markets, Personalities, Sales, Technology, Tesla, U.S./North America. You can follow any responses to this entry through the RSS 2.0 feed. Both comments and pings are currently closed.